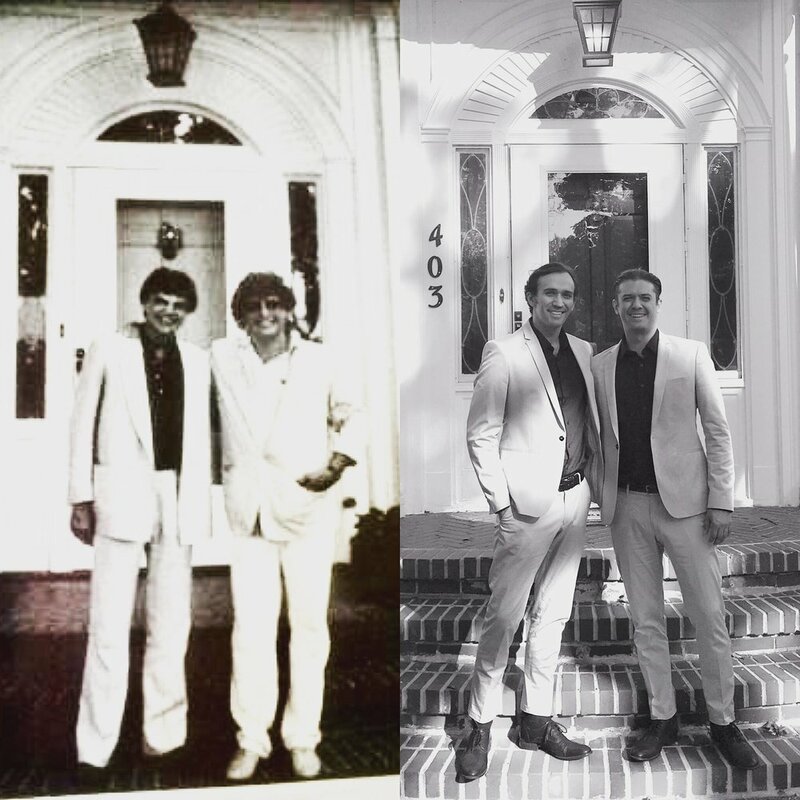 Dylan, Burleigh, and I had the honor of spending the day with Del Bryant, songwriter, former CEO and President of BMI, and son of Nashville songwriters, Felice and Boudleaux Bryant, who are two of the greatest American songwriters of the 20th century, and have one of the most magical love stories I've ever heard. Felice and Boudleaux played a crucial role in The Everly Brothers' success by penning over 20 billboard charting hits including “Bye Bye Love”, “All I Have To Do Is Dream”, “Wake Up Little Susie”, "Bird Dog", "Devoted To You", and “Love Hurts.” They even wrote the state song of Tennessee “Rocky Top”. The Bryants have probably contributed more successful songs to the mainstream of music out of Nashville than any other songwriting team. Their output includes more than 6,000 songs, with over 1,000 recordings, which have sold over 200 million copies. Del was kind enough to invite us into his home and share some of his parents original demos with us including songs that have never been recorded that were written for the Everly Brothers. He and his family are beautiful people, and they made us feel so at home. For sharing some of their family heirlooms, and invaluable time and council, We owe them immense gratitude. Although father Ike and mother Margaret Everly moved several times throughout their sons youth pursuing a career in the entertainment industry, Don and Phil spent many of their most formative years in Shenandoah, Iowa. At ages 6 and 8 they performed professionally for the first time on KMA radio on their parents radio show and soon after by popular demand were playing 5 mornings a week from 6am to 6:30am before school. 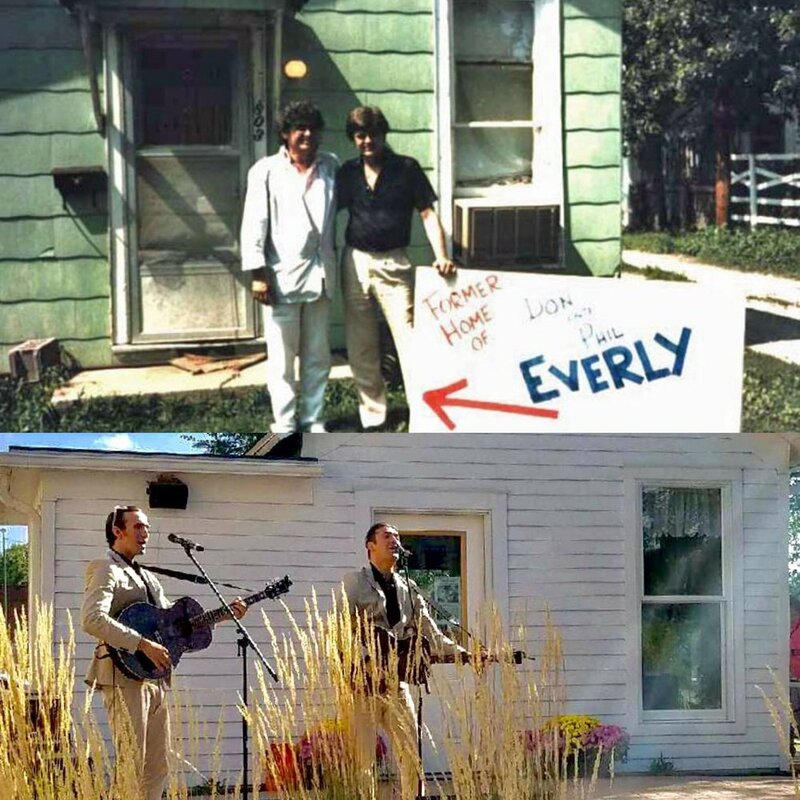 This Everly Family Radio Show helped the brothers garner a unique discipline and sense of value for community, music, and family. These formative years are among the important reasons why Don and Phil were, as producer and legendary guitarist Chet Atkins had referred to them, a 'cut above' the rest. In 1986, 3 years after the Brothers reunited from a 10 year hiatus. Long time resident and avid supporter of Shenandoah's charming community, Bill Hillman, organized a homecoming for the brothers. 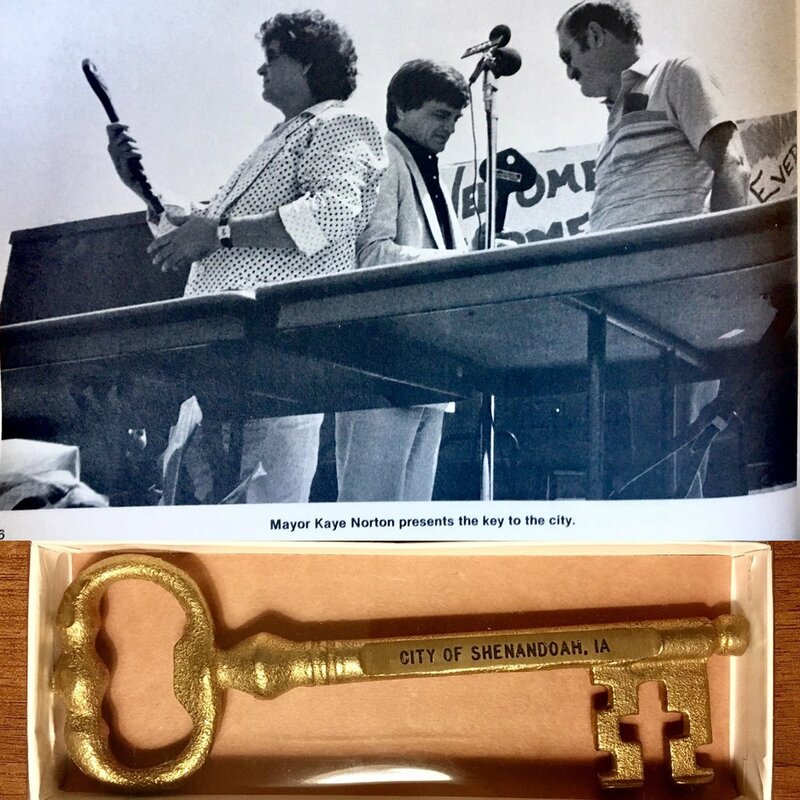 They performed outside The Depot for over 8,000 people (in a town of only 4,000), they partook in a parade in the back of the same 50's cadillac convertible from their music video, "Always Drive a Cadillac," they were given the key to the city by Mayor Kaye Norton (2 of them so they didn't have to fight over who gets it), they had a street officially named after them, and they were taken around town by Bill to rehash fond childhood memories. All these activities contributed to a day Don and Phil said, "Will live in (their) heart(s) forever." Don and Phil ended up forming a scholarship for student of Shenandoah to donate a large portion of their shows proceeds to the community that gave so much to them. 31 years later, (September of 2017) through the grace of mutual friends Sherry Davis and Sheryl Davis (avid music history preservationists) we got invited by Mr.Bill Hillman to partake in Shenfest, a festival that celebrates the past and present Shenandoan culture. At the festival, we were invited to partake in most of the same festivities that the Everlys did in '86. So not only did we get to soak in the landscape, the quality of the people, and subsequently the culture in which Don and Phil attribute to what largely taught them how to keep their heads on their shoulders and feet on the ground throughout their career, we got to interview and perform for Phil's high school graduating class of 1957 on KMA radio, we got to perform a benefit concert in The Memorial Armory and donate the proceeds to the same scholarship Don and Phil started in 1986, and last but not least.. totally unbeknownst to us, we were given THE KEY TO THE CITY by the same Mayor (Kaye Norton) who gave the Everlys' the key in '86! To have been accepted by the proud community in which the brothers grew up in, a town of roughly 4000-6000 since the 40's, to learning intimate details of Americas most influential Rock n Roll sibling duos up bringing from classmates/friends/and officials, and to have been able to give their time to the community the Everly's grew up in overwhelmingly affirms and enriches the mission they set out to accomplish in the beginning of 2016. For this absolutely singular experience that will holistically inform everything we do regarding The Everly Brothers Experience show here on out, we owe our immense gratitude to the town of Shenandoah, Sherry and Sheryl Davis for their sleepless nights in helping organize our involvement in Shenfest, to The Godfather of Shenandoah - Bill Hillman and his generous hospitality, and to all the kind folks who volunteered to make the event so special. Special thanks to The Bird Dogs Band, Devon Clarke Geyer and Adam Cotton for accompanying us on the journey to Shenandoah, and also thank you to Ryan Pineda for capturing the experience on tape. If you would like to see a video of our experience there, please follow this link. over the last 2 years, we have had the honor of becoming friends with, and getting to perform for, the great 60's pop singer Julie Grant, who actually toured the U.K. with The Everly Brothers, Bo Diddley, and The Rolling Stones in 1963! She was only 16 years old during that tour, while she had her hit 'Up On The Roof' written by Carol King and Jerry Goffin. You can see the picture of her in the advert and you can see her in the flesh on the left. She is the sweetest. Now, being a talent buyer, she welcomed us to the Wolf's Den at Mohegan Sun on the 20th anniversary of The Everly's playing there, and then a year later she welcomed us again at a lovely theater in Laconia, NH.